A screenshot of video footage that shows a man approaching the altar at the Cathedral Basilica of the Sacred Heart and punching Newark Archdiocese Auxiliary Bishop Manuel Cruz in the face during mass on Jan. 28. Video footage meant to record a sacred celebration instead is being used as police evidence and is circulating online as it shows a man attacking a Catholic bishop during a Mass at the Cathedral Basilica of the Sacred Heart in Newark, New Jersey, on Saturday. 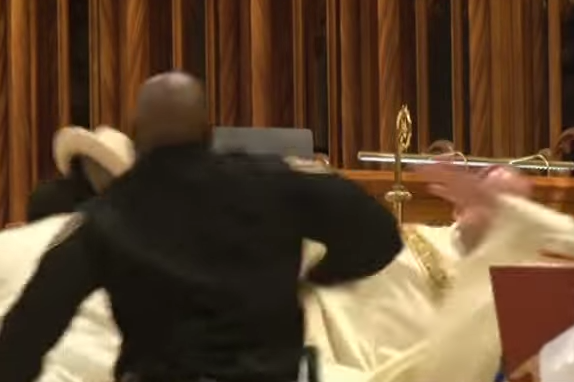 The video, obtained by TAPintoNewark.com, shows a man dressed in a white suit and matching hat stroll up to the altar and swiftly punch Newark Archdiocese Auxiliary Bishop Manuel Cruz in the face while he is speaking to the congregation. Police have identified the alleged assailant as 48-year-old Charles Miller, of Newark, according to NorthJersey.com. He has been charged with assault. Warning: The following video shows graphic footage that may be disturbing to some viewers. As the video shows, the incident sends the bishop toppling to the ground, along with a person who appears to be an altar server who stays by his side as police rush toward the assailant. TAPintoNewark.com reports several of the bishop's teeth were loosened in the incident, and a report by Philly.com adds that the bishop needed stitches for a cut lip.